Walter Bailey was born in Lynn, Massachusetts, in 1924. He was the son of Orange and Gertrude Bailey, and resided on Park Street in the city of Lynn before joining the Marine Corps in 1942. Bailey excelled at Marine training. He was in the top ten percent of his training platoon at Parris Island, receiving a promotion to Private First Class immediately after graduation and an assignment as a rifle range instructor. He attended additional training at Quantico, becoming a qualified small arms instructor for junior Marines, until his transfer to a combat unit in the fall of 1943. PFC Bailey carried a Browning Automatic Rifle with Company C, 1st Battalion, 24th Marines. As a BAR gunner, Bailey was “a brave and tough Marine” but something he saw in his first battle – the invasion of Roi-Namur in February, 1944 – made him question not only Marine tactics, but the operations of the Corps itself. As he advanced with three other Marines, a friendly tank appeared behind them, mistook them for Japanese troops, and opened fire. Bailey’s three comrades were killed before the tankers recognized their fatal error. (1) Later, witnessing the final moments that earned Lt. Colonel Aquilla Dyess’ the Medal of Honor, Bailey would deem the officer more foolhardy than brave for charging directly into enemy machine guns rather than taking cover. These incidents gave him much to think about while his company rested and re-trained at Camp Maui in the spring of 1944. Although Bailey may not have known it at the time, that day would be the last time he would see Charlie Company for the remainder of the war. After recuperating in a naval hospital at Aiea Heights, Hawaii, Bailey was sent back across the United States to Portsmouth. He served as a guard at the infamous Portsmouth Naval Prison for the rest of 1945. Bailey returned to civilian life after his discharge; he never spoke of his wartime experiences with his family, frequently finding comfort in the 23rd Psalm. He passed away in Peabody, Massachusetts in April of 2016 and is buried in Cedar Grove Cemetery. (1)Harold J. Goldberg, D-Day In The Pacific: The Battle of Saipan (Indianapolis: Indiana University Press, 2007), 231. The names of Bailey’s friends are not known, but they may have belonged to other companies in the battalion. 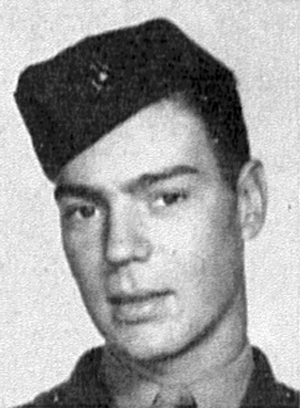 Charlie Company suffered two fatalities during this battle – 1st Lt. Theodore K. Johnson, company executive officer (gunshot wound to leg, buried at sea) and PFC Edward G. Galarneau (“cause unknown”).